Sarah Nader- snader@shawmedia.com Lucas Nichols of the Norge Ski Club comes down the hill during the 109th Norge Ski Jump Tournament held at the Norge Ski Club in Fox River Grove Saturday January 25, 2014. The tournament continues through Sunday. 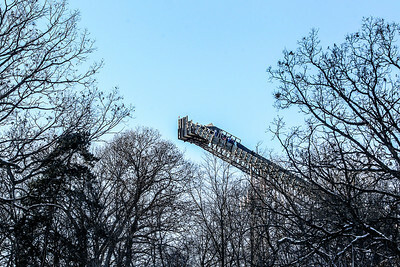 Sarah Nader- snader@shawmedia.com Kailey Bickner of the Norge Ski Club comes down the hill during the 109th Norge Ski Jump Tournament held at the Norge Ski Club in Fox River Grove Saturday January 25, 2014. The tournament continues through Sunday. 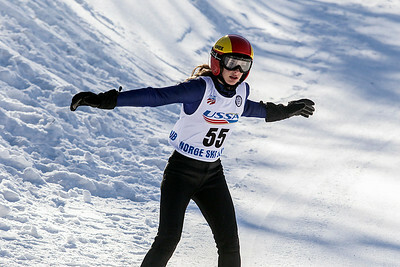 Sarah Nader- snader@shawmedia.com Mollie Immens of the Norge Ski Club comes down the hill during the109th Norge Ski Jump Tournament held at the Norge Ski Club in Fox River Grove Saturday January 25, 2014. The tournament continues through Sunday. 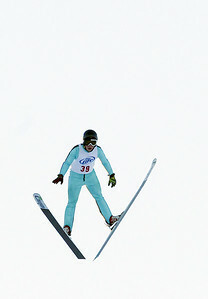 Sarah Nader- snader@shawmedia.com Shane Kocher of the Norge Ski Club flies through the air as he ski jumps during the 109th Norge Ski Jump Tournament at the Norge Ski Club in Fox River Grove Saturday January 25, 2014. 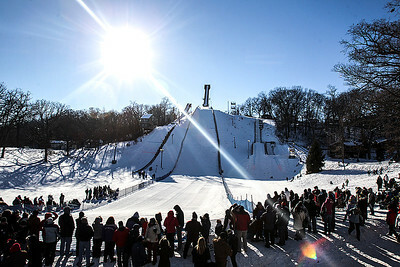 Four International teams were competing against elite Jumpers from the U.S. in the 4th stop of the 5-Hills Tour. Also, highly ranked U.S. Junior Jumpers from the Central and Eastern Divisions will be vying for an opportunity to participate in the Junior National Championships scheduled to take place at the Olympic Jump Facility in Park City, Utah in early March. Sarah Nader- snader@shawmedia.com The 109th Norge Ski Jump Tournament was held at the Norge Ski Club in Fox River Grove Saturday January 25, 2014. The tournament continues through Sunday. 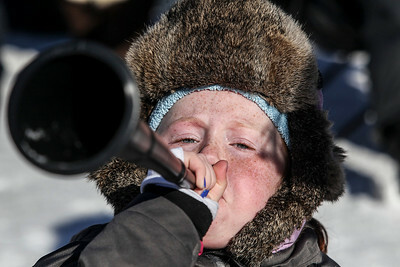 Sarah Nader- snader@shawmedia.com Bridget Trainor, 9, of Barrington blows her horn while watching the 109th Norge Ski Jump Tournament at the Norge Ski Club in Fox River Grove Saturday January 25, 2014. 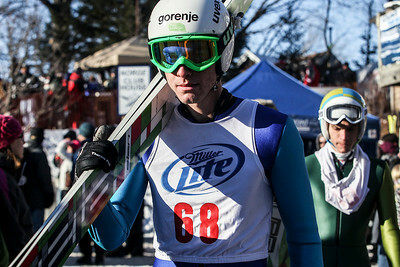 Sarah Nader- snader@shawmedia.com Slovenia skier David Krapez walks towards the jump during the 109th Norge Ski Jump Tournament at the Norge Ski Club in Fox River Grove Saturday January 25, 2014. 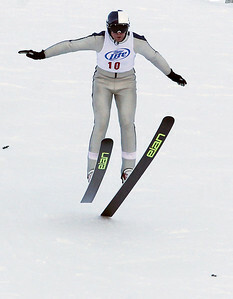 Sarah Nader- snader@shawmedia.com Patrick Gasienica of the Norge Ski Club is airborne during the 109th Norge Ski Jump Tournament at the Norge Ski Club in Fox River Grove Saturday January 25, 2014. Sarah Nader- snader@shawmedia.com Norway skier Geir Vethe comes down the hill during the 109th Norge Ski Jump Tournament at the Norge Ski Club in Fox River Grove Saturday January 25, 2014. 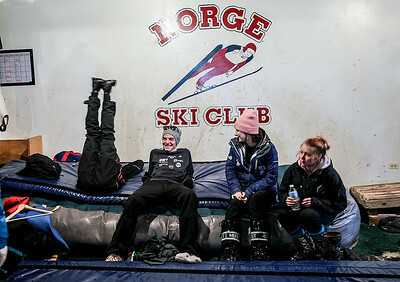 Sarah Nader- snader@shawmedia.com Ski jumpers rest before participating in the 109th Norge Ski Jump Tournament at the Norge Ski Club in Fox River Grove Saturday January 25, 2014. The tournament continues through Sunday. 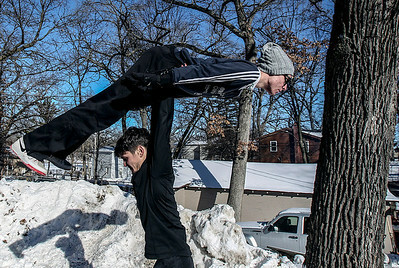 Sarah Nader- snader@shawmedia.com Coach Gaj Trcek helps Slovenia sju jumper David Krapez warm up during the 109th Norge Ski Jump Tournament held at the Norge Ski Club in Fox River Grove Saturday January 25, 2014. The tournament continues through Sunday. 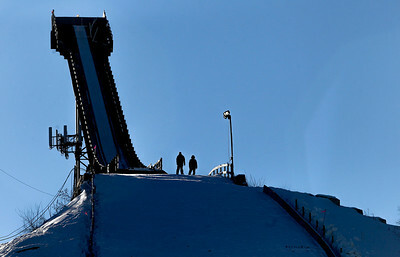 Ski jumpers rest before participating in the 109th Norge Ski Jump Tournament at the Norge Ski Club in Fox River Grove Saturday January 25, 2014. The tournament continues through Sunday.